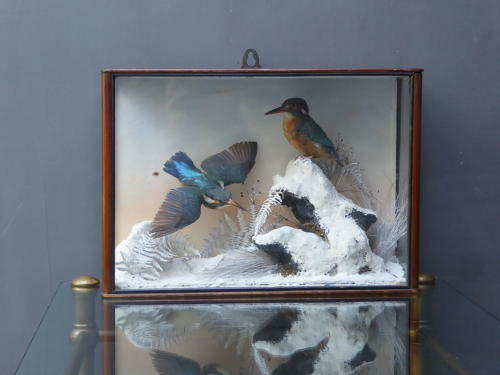 A beautiful early antique taxidermy study of a pair of kingfishers in winter. A truly stunning piece of taxidermy of the absolute highest quality with one kingfisher in flight & the other stationary on a rocky outcrop. Set in the most beautiful & realistic winter surroundings featuring snow, ice & subtle back drop depicting a winter sky, housed in a high quality pitch pine & ebonised wood glazed display case. Probably the most enchanting, well executed & perfectly balanced piece of taxidermy I have owned & very unique. Wear commensurate with age, excellent overall. The upper base of the case does have a few loose pieces of the ice / snow though these blend effortlessly & certainly does nothing to detract, overall the case is in good order showing one or two expected minor signs of age with all the original glass panels intact. Both specimens in excellent order with the colours more vivid in real life than in the images. Collection in person preffered though UK courier service is available at £18 tracked & signed for 24 hour delivery. Personal delivery / private courier available to some areas, please enquire for details.